Mr. Kavanagh represents public and private sector employers in Labor and Employment Law matters He counsels clients on wage and hour claims, The Family and Medical Leave Act, as well as employee grievances and arbitrations. Prior to law school, Mr. Kavanagh was employed by Mellon Financial Corp. as a Participant Services Analyst specializing in administering pension and 401-K plans for the firm’s clients. Before joining Cleary Giacobbe Alfieri and Jacobs, Mr. Kavanagh served as the judicial law clerk to the Hon. 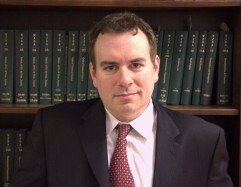 Robert J. Brennan of the Superior Court of New Jersey, Morris County.